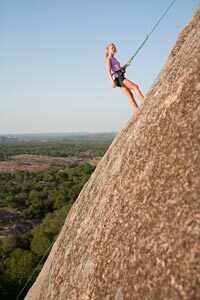 Enchanted Rock – Located in Gillespie and Llano Counties, 18 miles north of Fredericksburg on RR 965. 8.4 miles of hiking trails, nature trail, interpretive exhibits, rock climbing, wildlife. Call 325-247-3903 Lost Maples – Located in Bandera County five miles north of Vanderpool on RR 187. Check here for things to do in Fredericksburg, Texas and the surrounding area. Picnicking, 10 miles of hiking & nature trails, historical site/structure, watchable wildlife, fishing, swimming. Call 830 – 966-3413. Volkssporting – The first Volkssport event in the United States was held in Fredericksburg in June 1976. The Pilgrimage Routes consist of three different sanctioned walk routes and one bicycle route that can be walked/biked year round. For more information call 830 – 997-8056. The back roads of Gillespie County provide miles of scenic views for road bicycle riding. These roads are county roads that do have some traffic but offer beautiful views and scenery.